Ayman Mohyeldin is a Middle East-based correspondent for Al Jazeera English. 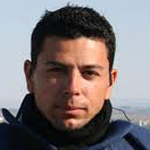 From May 2008 until May 2010, Ayman was the only foreign journalist based in the Gaza Strip. During the 2008/2009 War on Gaza, he was one of the only foreign journalists reporting from Gaza. Since joining Al Jazeera in 2006, Ayman has reported from Europe, the U.S. and across the Middle East where he has covered the siege on Gaza, sectarian strife in Lebanon, Palestinian in-fighting and human rights abuse in the Arabian Gulf. In 2007, Ayman's exclusive report during Egypt's referendum on constitutional amendments exposed serious voting irregularities and violations. Ayman was also among the first journalists to report on Gaza's intricate system of tunnels along its border with Egypt. Before joining Al Jazeera in 2006, Ayman worked for American networks. He was based in Baghdad where he covered the immediate aftermath of the US-led invasion of Iraq. While there, he reported on the daily struggle of ordinary Iraqis and embedded with the US military to report on the Iraqi insurgency. Ayman was among the few international journalists allowed to observe and report on the US handover of Saddam Hussein to an Iraqi judge. He has also produced exclusive reports from Libya where he was the first journalist to enter one of Libya's nuclear research facilities. Ayman began his journalism career working for the American network NBC in Washington where he covered the inauguration of US President George Bush, the September 11 attacks and the war in Afghanistan.